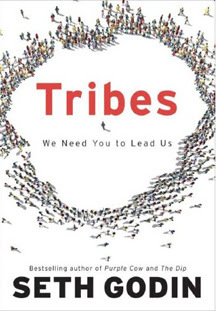 The book of the week was Tribes by Seth Godin. There are quite a few little tidbits that give me that "Oh yeah! That's true!" kind of thought process. Right toward the end of the book Godin writes this: "Leaders have nothing in common. They don't share a gender or income level or geography. There's no gene, no schooling, no parentage, no profession. In other words, leaders aren't born. I'm sure of it." It's very smart... obvious, yet thought provoking. To be a leader is to make a choice. Sure, it may be easier for some to make that choice, but anyone can make it. The book is about leadership. The idea is that a tribe is a strong organization with a strong fan base of members and strong leadership. I like the idea of a tribe. An organization that is so strong that it's members will fight for it's survival and put every ounce of effort in to maintaining continual success. Tribes don't grow on trees. They are developed by strong leaders. The leader doesn't need to have authority in the organization it is trying to transform into a tribe. A leader just needs raw passion and hunger for their desired outcome- The Tribe. Two things I want to talk about from this book... Fear and Entertainment. Interesting couple of words. But they both deal with leadership as Godin writes about in this book. Fear is a huge deterrent for individuals to step into leadership roles. That is the choice I was talking about earlier. It really comes down to choosing to step away from the status quo and into something new and better. It's easy to stick to the status quo, but the status quo is boring and not effective. People fear criticism more that anything else when stepping into a leadership role. "What will people say?" "What if people don't like my decisions?" "Will people follow me?".... The answer to all of the above- "It doesn't matter." These questions should not be a determining factor is stepping over the fear-line. This is easily the most difficult part of being a leader, but it should never deter you from continuing your path to make a better organization. The bigger and better changes you make, the more people will judge and criticize your actions. But no one has ever achieved greatness in the area of leadership by sticking to the status quo. The next concept I want to talk about is Entertainment. This is an idea that is missed by a lot of leaders. They don't have the attention of their audience. If you can't make people interested in listening, then you have the cards stacked against you. The best way to illustrate this is with a teacher in a lecture hall. A teacher has a great venue for leadership. A lot of teachers are arguably some of the best leaders in the world. However, when you have a teacher in front of a bunch of students and the students are bored out of their minds, they aren't retaining the information and thus, they are not being led effectively. The same idea applies to organizations, if you are trying to lead the people of your organization to be more successful, but you can't capture the troops attention. You are fighting a losing battle. You have to bring charisma to the table. Get excited, fake it if you aren't. It's not easy to always be energetic, but it's the best way to get people's attention. So do whatever you have to do to make sure you aren't being boring.... coffee, tea, red bull... Whatever it takes! Once you have their attention, you just need to stick to your plan and choose everyday to continue to be a leader. I think this was a fun little book. And it's been a few weeks since I had read a leadership book. And this one was really good to get me thinking about my own leadership techniques. As always, if you have any questions on the book don't hesitate to ask. I would be more than happy to help anyone that wants it.